In October, 2017, Modern Edge’s CEO, Charles Austen Angell, participated in the EVA Technology Workshop at NASA’s Johnson Space Center in Houston. Presentations provided an overview of NASA’s latest strategies and plans to extend human exploration. Modern Edge’s expertise with wearable technology spurred dynamic discussion regarding extravehicular activity/spacesuits. “The intent of the workshop is to bring the broader EVA community together to discuss, collaborate, and inform pertinent EVA technology development efforts. 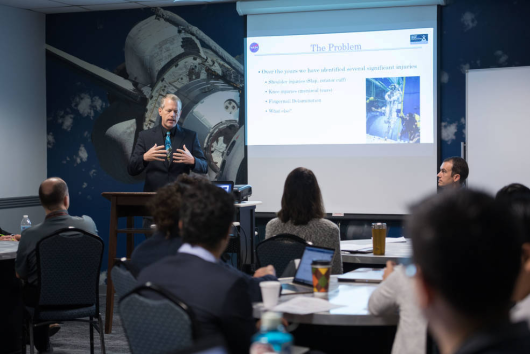 The workshop will focus on need areas related to: Technology, Knowledge, Architecture and milestones to support NASA’s Exploration initiatives.